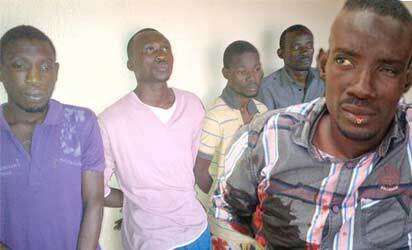 A deadly gang of robbers, headed by an infamous robbery tsar, Abiodun Ogunjobi, a.k.a, Godogodo, assaulted a warehouse belonging to Blessing Aporie Nigeria Limited at Ajao Estate area of Lagos State and snatched mobile phones worth more than N50 million on Sunday, July 14, 2013. The robbers also killed a policeman on guard at the warehouse, leaving one other with severe bullet wounds. Five members of that gang were later killed by operatives of the Special Anti-Robbery Squad, SARS, during a shoot-out along Eko Bridge while three others escaped with bullet wounds. However, operatives of SARS, led by Superintendent of Police, Abba Kyari, have arrested the three bandits who escaped during the shoot-out and they have confessed to the crime and narrated how Godogodo led them through the operation, which turned out to be his last in Lagos. Sources at SARS said four teams of operatives were deployed that night to track down the robbers when news of the incident and the attack on policemen filtered in. The reporters have gathered that the team which was deployed to Surulere area, spotted a Honda space bus, matching the description of the one used by the robbers and they chased it up to the Eko Bridge where a gun battle ensued, leaving four persons dead while three escaped. One of the suspects identified as Ganiu Mental was arrested with bullet wounds. The source added that the police arrested the first suspect, Ahmed Adelawo, who sustained bullet injury on his leg, when they intercepted conversation between him and a native doctor, whom he paid N15,000 to prepare a charm that will prevent the police from arresting him. “We arrested the native doctor and we used him to arrest Adelawo in Ikotun, where he was receiving treatment for his bullet wound. “We then used Adelowo to arrest Leke Ayinde and Abiodun Yinusa,” the source said. Meantime, the arrest of Yinusa didn’t come easy as he fled from Lagos State after the robbery incident. The source said: “He ran to Akwa Ibom State when he learnt that we had arrested Adelawo, but he came back last Wednesday to attend to a case he had in court for stealing. Our operatives got information and stormed the court and arrested him on his way out. “When the bandits were brought before Godogodo who was arrested penultimate Thursday in Egbeda area of Ibadan, after a massive manhunt by SARS operatives, they explained that they brought in Godogodo to help them dislodge the mobile policemen that were on guard at the warehouse where the robbery took place. Yinusa, who is a resident of Ajao Estate, said: “I owned the job. I was the one who got Adelawo and others involved. I, Adelawo and Chuks have been operating within Ajao Estate because we are all residents of that area and we are familiar with the terrain. “The warehouse is located at the spot where I usually go to smoke Indian hemp and I know they used to store expensive mobile phones. “I have also assisted them in off loading one of their containers, an opportunity I seized to survey the place. Three months ago, I, Adelawo and Chuks went to rob at the warehouse and we stole phones worth only N200,000. “We couldn’t get into the place where the expensive phones were stored. After that operation, the owner of the warehouse changed the doors, installed security camera and they also brought some armed mobile policemen to guard the place. “My friend, Adelawo, got broke and he said he wanted us to attack the warehouse again. I told him that it would be difficult because there were policemen on guard, he said he knew people who could repel policemen and get what ever they wanted. “I told him to contact them. One of them was Godogodo. “On the night of that operation, Godogodo came to Ajao Estate in two Range Rover SUVs and he called us to lead them to the place. On arrival, they cut the key to the gate of the warehouse, Godogodo and his friends went into the security house, opened fire on a policeman on guard and collected his rifle, uniform and bullet proof shirt. “Then they smashed the wall to the warehouse with a sledge hammer and gained entrance into the warehouse. After about 30 minutes, they loaded the SUVs with mobile phones and other gadgets. “But on our way out, some policemen who attempted to confront us were repelled by Godogodo’s superior fire power and we escaped. Reacting to the narrative, Godogodo told Vanguard that he wasn’t aware that their target in that operation was mobile phones warehouse. “I am bigger than mobile phones, I can’t steal such anymore. These boys told me that there was N70 million in that warehouse; that was why I went with them.